Swim to Run, Run to Swim: If Navy Seals can do it, why not you? In one of my previous posts, I discussed how adding another sport as an alternative to swimming is beneficial, not only for your health, but also for improving your swimming. To make the point even stronger, listen to what Aaron has to say about the cross-training of running and swimming. This is a guest post by Aaron O'Connor who runs, writes, and is an amateur fitness trainer in Washington state in USA. Maintaining a healthy lifestyle goes far beyond daily exercise. It is a routine, a culture that demands a balanced diet and psychological stabilization in addition to physical workouts. Unfortunately, many people today overwork and damage their muscles by working out too frequently or by doing a repetitive task at work without taking a break. A well-studied way to prevent this from happening is to alternate your routines, especially when it comes to cardiovascular exercises like swimming and running. In fact, running can actually improve your swimming dramatically. The best treadmill reviews will tell you that running isn’t something you should take lightly. 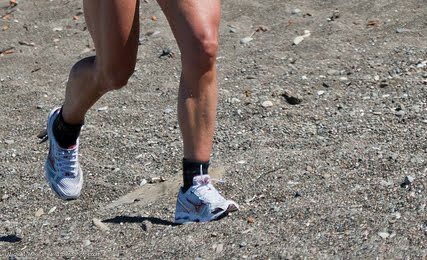 It requires a proper technique and the proper footwear to get the most out of your exercise. While running is definitely considered a total-body workout, it strengthens leg power above all else and leg power happens to be absolutely essential to a great swimming experience. Many people believe that swimming demands only a strong upper body, but a person with Schwarzenegger biceps (Note from Swimator Blog: see the Arnie Swim Type) wouldn’t get anywhere in the water if he/she didn’t have a powerful and efficient kick. Swimming requires a successful combination of two actions: pulling and kicking. The pulling action strengthens your chest and back muscles, while your hips, groin and legs provide kinetic, propulsive power in the water. It makes sense, then, that having stronger legs is linked to more efficient swimming. Some experts consider the coupling of swimming and running to be one of the most effective cross-training exercises for athletes. Both routines are cardiovascular exercises that improve endurance, recovery and core strength. For runners, swimming actually takes pressure off overworked joints, especially those in the knees, while strengthening total muscle mass. For swimmers on the other hand, running adds muscles to the legs while balancing the act of running with a strong upper body workout. Done cyclically, these two exercises completely work almost all of the major muscles in your body. Runners and swimmers have a very similar body type when it comes to muscles: lean, but with no bulk. In a book called "Swimming Fastest", Ernest W. Maglischo advocates including running exercise in a workout routine in order to improve swimming, arguing that endurance is greatly lengthened by adding running to a workout regimen. He states that running will train circulatory and respiratory systems to "improve cardiac output, stroke volume, tidal volume and pulmonary diffusing capacity." This ultimately improves oxygen delivery during swimming, according to Maglischo. (Note from Swimator Blog: In laymen terms, running makes your heart more efficient and effective at what it does best, pumping blood throughout your body to keep the oxygen supply at a good level). Maglischo also states that running improves muscle adaptation in the legs with "increased capillarization, better blood shunting and increased size of the mitochondria." All of these improvements generally lead to better circulation, greater, more efficient breathing and have a dramatic impact on the overall experience of swimming. In general, workouts in the gym that include running improve swim times. Power training increases speed in swimming by building resistance and running improves endurance, which a wide array of observation from professional coaches supports. The Navy Seal workout routine, which is an acclaimed system for generating top-notch performance in these military professionals, is built upon the principle that strong swimmers are stronger runners. During the first week of this program, trainees are expected to run six miles a week, with 15 minutes of continuous swimming each day. In addition to this activity, trainees are also expected to do sets of push-ups to strengthen their core, as well as pull-ups to generate a balanced upper-body workout. Does it surprise you that during the first week the amount of swimming done overall seems comparable to the amount of running? Navy Seals physical trainers obviously realize the benefits of this cross training. By the ninth week of the Navy Seals training program, trainees are swimming for 35 continuous minutes every day and running sixteen miles per week. This is an extraordinary amount of physical activity in a span of just seven days, and yet the body is able to endure these rigorous workouts because the prior routines focused on developing all muscle groups. Ultimately it’s hard to ignore the macroscopic benefits that running and land training have on our ability to move in the water. If you’re interested in examining how the running and physical exercises portion out over nine weeks and beyond, you can look through a more detailed layout of the Navy Seals workout regimen. Likewise, an average person who doesn’t want to be a Navy Seal can take valuable insight away from this acclaimed exercise regimen. Scale these activities down to levels that work for you, there’s no doubt that over time you will recognize how much running improves your swimming and vice versa. As more people continue to realize the importance of cross-training in running and swimming, more comprehensive information will become available to the public to make informed decisions on what routines are right for them. In general, if you have access to a physical trainer then it’s recommended that you consult them for advice on how to create workouts that are right for your physical build and goals. Always put your safety first. There is no doubt about the greatness of Mark Spitz in his time and Michael Phelps’ recent ongoing dominance on the swimming scene. Both Mark Spitz and Michael Phelps are multiple Olympic champions with many world records under their belts. 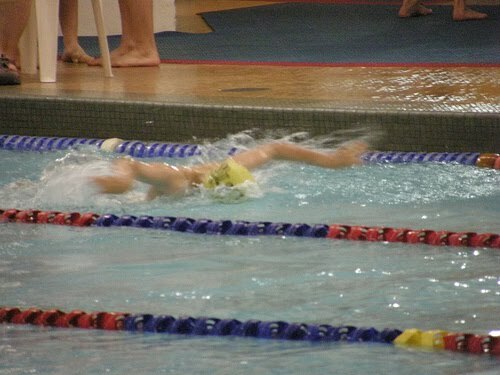 Every competitive swimmer knows their name and dreams of their swimming accomplishments. These two swimming giants are separated by four decades of swimming science innovation and an unprecedented technological revolution. When Mark Spitz cruised to his 7 gold medals in the 1972 summer Olympics in Munich, Germany, the Internet was just being invented and nobody was aware of its large potential and how it will change the human kind. When Michael Phelps beat Spitz’s record and claimed 8 gold victories in the 2008 summer Olympics in Beijing, China, the Internet already enriched the lives of about ~25% of the world’s population. In 1972, nobody really knew who Mark Spitz was unless they were keen swimming sport enthusiasts or journalists. In 2008, the whole world was watching Michael’s incredible reign and probably millions of tweets were sent around to announce his victories. I don’t even attempt to predict what will happen in 2012 summer Olympics in London, UK, but it will be the most amazing Olympic event for the swimming community yet to be recorded. Back on track though, so we have two extremely talented swimmers who were/are on top of the world as the best swimmers in their time and age. Has anything changed since Mark Spitz cruised to his Munich Olympic victories in 1972? Both Phelps and Spitz swam the butterfly stroke as their signature style, so after our discussion of the top 4 most common butterfly mistakes let’s have a look on how these two super swimmers did it and how they compare against each other. 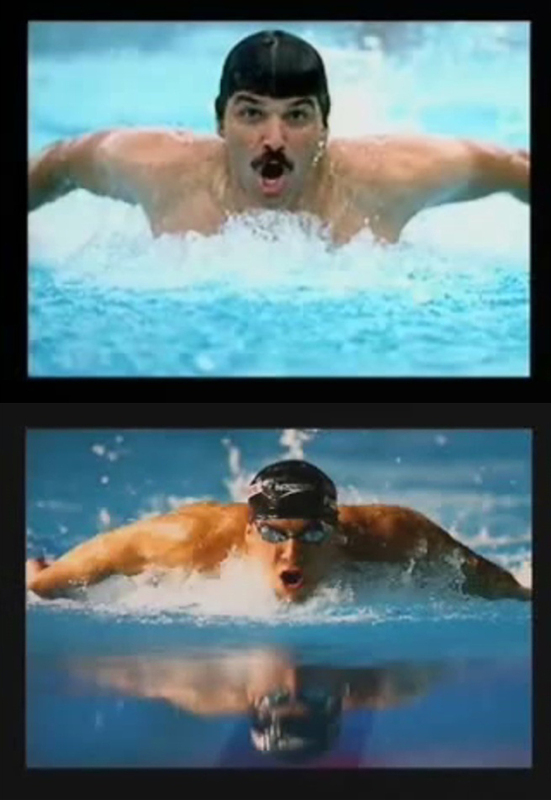 Apart from the obvious that Mark Spitz had a mustache, didn’t have an access to a full Speedo LZR suit, didn’t use swimming goggles and didn’t wear a swimming cap, the most interesting differences come to light when we examine the video footage and photographs from their butterfly events. The main visible difference comes to light during the breathing part of the stroke. Mark Spitz employs the over the water concept and lifts his head and body quite high out of the water. Michael Phelps on the other hand is using the more modern style with very slight oscillation of the body and just skimming the surface with his chin. Spitz is creating a lot more up and down motion which in turn translates into a much higher drag coefficient and thus slower or more energy wasting swimming style. Michael uses majority of his energy for forward motion instead of the lift motion, therefore, making him much more efficient in the water. One thing in regards to breathing is common between these two super athletes though. They both breathe every stroke. Michael does not breathe off the start and off the turn, but otherwise every stroke. The idea here is that breathing every stroke keeps the swimmer in the correct rhythm and it supplies the ever needed oxygen. Also, it was said that if a swimmer breathes every other stroke, during the non-breathing cycle, his/her body is deeper in the water, thus adding to the swimmer’s dreaded drag. In contrast, with every stroke breathing, the swimmer stays higher in the water and has to exert less energy into forward motion propulsion. What else is different? How about the way the arms move during the recovery cycle of the stroke (above the water)? In Mark Spitz’s case, elbows are bent which causes a lot more stress on the shoulder, more energy output since more muscles need to be involved to perform the bent motion and most of all, the higher body position during the breath as he needs much more room to clear the water with his arms. Michael, on the other hand, has his arms nice and straight, just skimming the surface of the water which saves energy and also makes the arms move faster during the butterfly recovery phase. I wasn’t able to find a great underwater footage of Mark, but from looking at a short front facing video, we could see that he keeps his elbows quite bent on the entry and also his hands are producing a lot of bubbles. Michael, keeps his arms quite straight on the front entry and there are almost no bubbles under his hands in his stroke. You might be wondering, what the heck am I talking about, "bubbles"? And rightfully so. This is an advanced skill to master, but the idea is that your hand should enter the water so cleanly that you do not trap any bubbles in your palm and fingers. This bubbleless entry will allow you to catch the water much sooner and your catch will be more powerful since you are catching water and not air. Next time you are swimming, why don’t you look at what your hands do in the front of the stroke during the entry and watch for the bubbles. Try to adjust your hand entry or your underwater reach, so the bubbles that are created by the hand disappear before you start with your catch. Finally, in today’s competitive swimming world, if you do not have a powerful underwater dolphin kick, you are as good as fish without a water. Some coaches even go as far as calling the underwater dolphin kick, a fifth stroke. Michael has one of the best underwater kicks in the world, so the kick also contributes to his success. During Mark Spitz’s time, there was no such thing and everybody popped up out of the water as soon as they pushed off the wall. As a side note, not really related to the butterfly stroke, check out the start differences. Spitz, as everyone else at that time is using a feet together start (grab start). Nowadays, track starts are much more popular. Also, most of the swimmers in Spitz’s time didn’t grab the block with their hands, instead they used their hands to swing their body forward. Today, the arm swing is only used during relay starts, but for individual events, everybody grabs the block and uses the hands to generate more power off the block. There you have it. 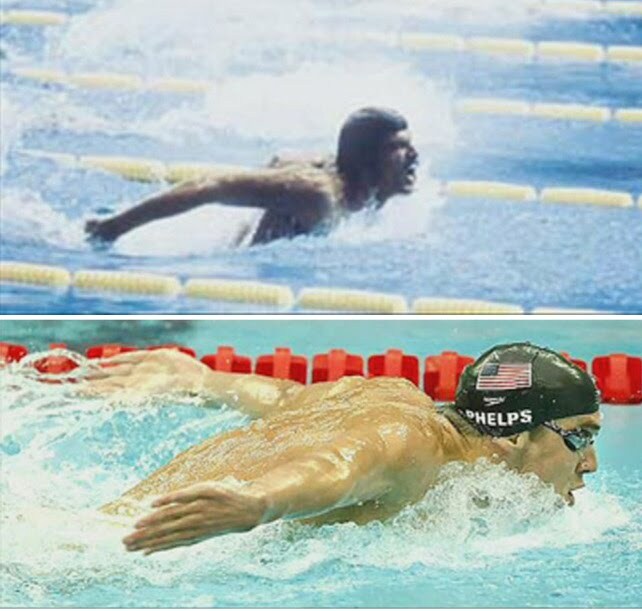 High level analysis of what swimming was like for Mark Spitz and how it has changed for Michael Phelps. If you spot any other differences, please share them with us in the comments. It is amazing how the sport evolves as our understanding of the swimming science becomes more astound. I definitely applaud all the swimming researchers out there who are trying to make our sport better. Well done and keep up the good work. After Matthew shared his swimming suggestions with us, I thought it would be interesting if he'd also shed some light on the game of water polo for the Swimator Blog readers. Even though swimming is a wonderful and healthy sport, there is no doubt about it that it can also be quite dull and boring. If you really think about it, going up and down the pool from wall to wall is a bit nuts. The best coaches know this, however, and try to motivate their swimmers and spice up swim practices with new swimming drills, or with the use of technique swim equipment (aka swimming toys), or have the team play an occasional game of water polo. When I was younger, we even had a water polo tournament within our swim team and the winning team would get a t-shirt. This definitely got us work far harder and beyond what we'd do in practice. Apart from getting swimmers out of the monotony of daily swim practices, water polo also serves as a great team building activity. Swimmers have to think as a team and play as a team in order to win. In swimming this is sometimes overlooked as the focus is mainly on individuals unless you are talking about US college and high school swimming. Water polo is also an awesome way to whip swimmers into shape. The sport is much more demanding on stamina and sprint power than swimming itself, so having a routinely scheduled water polo game in practice at the beginning of the season will get swimmers into shape quicker rather than only focusing on the usual off-season drylands. And finally, it is just plain fun to play water polo:). This is a guest post by Matthew White from waterpolouk.com. Water Polo is a fast dynamic sport played by people around the world. It was actually one of the original events in the first modern Olympics. The simplistic idea of the game is to throw a ball, the same size as a football, but slightly heavier, into a small goal at opposite ends of the swimming pool. Usually, and at all high standard games, the pool is all deep which means players have to tread water at all times. Treading water coupled with the swimming aspect means that elite water polo players along with ice hockey players are generally regarded as some of the best all round athletes in the world. This is due to the sheer power, strength, endurance, as well as flexibility and swimming fitness needed during water polo. In fact, water polo professional players train sometimes even for 6 hours a day. A Water Polo team consists of 6 outfield players and 1 goalkeeper in the pool and a further 6 people on the bench. In total, 13 players who can all go in and out of the game as many times as they want. The tactical set up is very similar to basketball. Five players form a virtual arc around the opposition team's goal and a power centre forward takes position in front of the goal (see image below). The beginning of a game starts with a race to the centre of the pool to retrieve the ball. So, the fastest sprinter always wins. In many cases, the first aim in an attack is to win an exclusion, which means an opposition player is deemed to have fouled your player in a manner where they are excluded from the play for 20 seconds. Offences for exclusion include: any form of a foul on the centre forward (if they are near enough to the goal), head tackles, over aggressive tackles, pulling players back and dangerous play. However, the best way to force an exclusion is to play the ball to the centre forward. When the one man up advantage is won (this would be called Power Play in ice hockey), the team will then operate a tactical move to work the opposition's players hard enough to score a goal. I must point out that this is far from the only way to score, but very important to know. Well, here in the UK we do often wonder, but usually if you are holding the ball your opponent can legally grab and push you and try to steal the ball. As soon as you let go of the ball, however, the opponent has to release you, if they do not, then it is a foul. Why take up water polo? As already discussed, apart from the obvious great health benefits in terms of endurance and stamina building, water polo can also serve as an outlet for swimmers. Let's put one myth to rest though. There is a common misconception, in the UK at least, that water polo ruins swimmers strokes, this just isn’t true, and I don’t know where it has come from. (Note from Swimator Blog: The misconception is probably rooted in the way a water polo player swims with the head out of the water which is not a proper swimming technique for swimmers) From my experience water polo keeps swimmers swimming; I certainly would have given up if not for the game. There is a huge dropout rate in competitive swimming when the swimmers get to their late teens, and in the UK I think it is because coaches (and I’m generalising) take the sport very seriously even at local low level clubs. Young swimmers who will never make the Olympics, train 4 hours a day and are forced to think they have failed when they don’t make it. The irony here is that they are still great swimmers in comparison to majority of our planet's population. It is such a shame they give up. Between swimmers this is sometimes called 'burn out'. I think being a team game, water polo helps the players keep it up. We swim as a team and motivate each other, and ultimately we never give up the game or swimming and just try to have fun! More about Matthew White: He is a water polo enthusiast who writes on behalf of The Sanctuary Spa who sell gift vouchers for swim, sauna and steam days. From Swimator Blog: If you have never played water polo with your team, why not suggest to your coach to try a game. You just need a ball. Instead of the goals, you can use the swimming blocks or just standing kickboards. If you don't have a team, try mimicking some of the water polo player's moves, treading water for a few seconds, sprinting 10 meters, then treading water again and repeating it 5 times. You will be shocked how hard this game is. Being out of breath will never have the same meaning :). If you would rather stick to swimming, then learn to swim more efficiently in your next session. I have already discussed proper body position while swimming freestyle and the drag forces that act upon your body on numerous occasions on this blog. However, the reality of it is that, it is very easy to say "swim relaxed with good body position", but a bit more difficult to actually perform such feat. It is no surprise that one of the most frequently asked questions I get on the Swimator blog has to deal with the frustration of your legs sinking even if you put your head in the water. So, to help you with keeping your body nice and straight in horizontal position, I have a wonderful treat for you today. What if I told you that there is a piece of a swimming equipment out there which helps to align your body by helping your legs float up to the surface and all that with a minimal effort and time commitment from you. Are you excited yet? Meet the "shinfin™ leg fins". What are shinfin™ fins and what do they do for you? 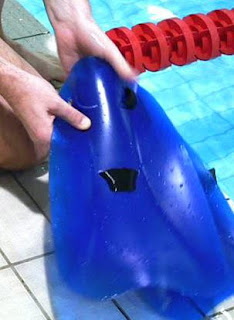 Shinfin™ leg fins are a unique type of swim gear, which slightly resembles normal swimming fins, however, before I go into more details, DO NOT mistake shinfin™ fins for actual fins. Please, keep an open mind and forget about regular fins and the propulsion style they give you. Think of it more in terms of a shark, a dolphin or a tuna fish perspective. They all have many fins, but only the rear (caudal) fin gives them pure propulsion, all the other fins (e.g. dorsal, pectoral) are mainly for vertical maneuvering or directional changes. shinfin™ fins are in this case a combination of vertical maneuvering fins like the pectoral fins on a shark, and a streamlined propulsion style like the caudal fin of a dolphin. Another analogy could be the one of a dolphin flipper. Dolphin has also flippers in addition to fins and rear flukes. The difference is that flippers contain some residues of bone structures in them and fins do not. With shinfin™ fins it is very similar as they are attached to your legs and not feet, so the lower part of your leg is actually integrated as a part of the shinfin™ product, like a flipper. So, now that we have established our open mindedness, let’s begin. As I already mentioned, the unique visible difference between regular swimming fins and shinfin™ fins is that shinfin™ fins attach to your shinbone and extend on the top of the front of your foot. This leaves your foot free for walking, pushing off the walls or diving into to the pool. This leg attachment also alleviates any ankle or cramping problem swimmers often experience from wearing regular fins on their feet. The structural design of the shinfin™ leg fins is also quite unique. The rounder shape of the fin in combination with the attachment to the leg works as a lift force on your lower limbs while making it harder to bend your knees. This is prefect for swimming, because wearing the fins on your shins will cause your legs to rise automatically (even without kicking) and it will make it a bit more difficult to bend your knees (working your quad muscles a bit harder). If you recollect from my previous body drag article, such a position and narrow kick reduces swimmer’s drag in the water and allows a swimmer to focus on improving other important aspects of the stroke. In other words, with fins on your shins rather than you feet you will swim in a nice streamlined position with minimal effort and high efficiency, so fighting the water to stay afloat will no longer be your problem. What are the specifications of shinfin™ leg fins? The fins are made out of a very pleasant high quality polyurethane material. Softer at the toe side of the fin to allow the fin move through the water easier while not putting too much pressure on your toes and tougher on the leg side to keep it nicely snug to the leg. 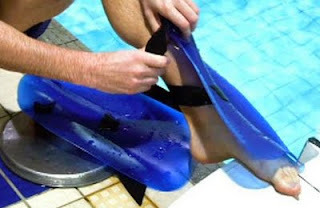 The fins come with two heavy-duty rubber straps which are used to attach the fins to your legs. The putting on and taking off of the fins takes a bit to get used to, however, when you figure out the right motions for the job, you can get them on and off without any hassle. The manufacturer also supplies very detailed instructions on how to do that inside the package with the fins, so that will make the task easier when you try it for the first time. Once shinfin™ leg fins are adjusted properly on your shins they feel quite nice and comfortable on the legs without any major discomforts. The fins are almost made in the one size fits all equivalent. They come in one size which should fit for swimmers between 140 - 200cm (4'7" - 6'6") tall. To top it off, you have a choice of three colors: blue, white and black, so getting them to match your swim suit is not a problem :). How to use shinfin™ fins? Streamlining your kick - one of the most common mistakes during freestyle is the exaggerated span of the kicks. Most beginner swimmers kick too far down which causes extra drag. With the shinfin™ fins you are guided to kick in a smaller space, like if your feet were trapped in a bucket. Improving body balance during breathing - another common mistake is spreading your legs during a breath in freestyle. With shinfin™ fins you get an extra support for your body during your breathing, so taking a breath is a breeze. Eliminating calf cramps and walking clumsiness during longer snorkel trips. You can also wear more comfortable shoes with the shinfin™ fins and as a bonus you might just save some coral by not kicking into it with longer diving fins. All in all, the shinfin™ leg fins do the job of bringing the swimmer in more horizontal streamlined position very nicely. Having your legs sink and overtly bending your knees after you put on the shinfin™ leg fins is almost impossible. So, whether you are a beginner who is learning to swim or an advanced swimmer, shinfin™ fins will help you improve. (be it as an aid to your body alignment or as a tool to strengthen your legs and core body) Furthermore, the universal usage and the one size fits all solution is an awesome addition to your family’s arsenal of swimming toys. Beware however, if you start off expecting shinfin™ leg fins to have the same propulsion style as regular fins you could end up disappointed. The fins for your shins serve a quite different purpose than then regular fins, so in my opinion they are mutually exclusive and not alternatives. Make the straps wet before you attempt to adjust the straps. Actually, try to put the fins on in the water as the extra water helps them slip through the slits. Do not be afraid of bending and pushing on the polyurethane material when adjusting your straps. The material of the fin and the strap is very durable, so don’t worry about using more power to get the desired snug fit.